Paul Cook summed it up in a typically forthright manner. In the 38th minute Darron Gibson gave the ball away to George Friend, who won a penalty following a naïve intervention by Cedric Kipre. Then five minutes later Christian Walton palmed a cross to Jordan Hugill who blasted the ball into the Wigan net. Cook had fielded a balanced line-up. Nick Powell returned, with Josh Windass moving to centre forward. Lee Evans came in for the suspended Sam Morsy, Gary Roberts for Kal Naismith in left midfield. In the first half hour Wigan had not played at all badly, although Middlesbrough had looked dangerous from crosses coming in from the wings. Indeed, it looked like they had a goal coming but Nick Powell cleared Aden Flint’s header off the goal line. Latics have gained just four points from their last eight matches. However, during that time they faced all the teams currently in the top five positions of the Championship table. He did not mention the visit to Norwich City, the current leaders. But that 1-0 defeat at Carrow Road at the end of September must seem like an awful long time ago to him now. Three of those games coming up are against teams currently in the bottom five of the table. However, games at Bolton have never been easy for Latics. Moreover, Wigan’s head-to-head record against Blackburn is not good. 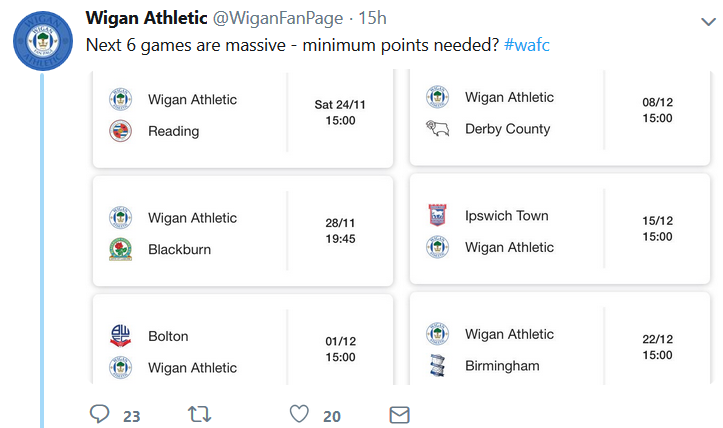 But four of those six fixtures are at the DW Stadium. For the moment Cook will be looking at the Reading game a couple of weeks or so from now. The Royals have lost their last three away games, with just one victory on the road in mid-September at Preston. Cook will be looking for a solid performance, free of major errors. What has happened to Darron Gibson? In the opening game of the season against Sheffield Wednesday Gibson really impressed and left the field to an ovation from the crowd. He looked a fine player that day, spraying out accurate first time passes, solid in his defensive duties. Yesterday he looked a shadow of his former self, imprecise in his passing and inconsistent in his tackling and covering. Gibson arrived in summer after having a difficult time in a struggling Sunderland side. In recent weeks he has found himself once again in a team that has been struggling. The 31-year-old has pedigree, evidenced by more than 80 appearances at Premier League level. Gibson was one of many Latics players who were struggling to find their best form yesterday. With captain Sam Morsy due to return from suspension Gibson will most likely be competing with Lee Evans for the second spot in holding midfield. Stewart Downing might be 34, but he remains a fine player at Championship level. His presence on the right wing was always going to be a tough test for Wigan left back Antonee Robinson. Downing was certainly a headache for Robinson to deal with in the first third of the game. But Robinson stuck to his task and Downing was less and less of a threat as the game progressed. Robinson’s defensive frailties have been exposed in the past couple of months, with his displays at international level for the USA coming under scrutiny of the mass media. However, the 21-year-old remains a good prospect. He has lightning pace and a sweet left foot. The variety of players used on the left wing certainly cannot have helped Robinson over these months. The mutual understanding between full back and winger is a key aspect in Cook’s football. Moreover, the protection that Robinson has received from those wide players has been variable. At times he has been left horribly exposed. Burn had a poor game against Leeds United, but there was some improvement yesterday, when we saw flashes of confidence from him. Wigan’s back line had not pressed up so high and Burn looked more comfortable. Moreover, Boro put more emphasis on lofted crosses from the flanks than Leeds, who relied more on pace and movement. Some critics on the social media have questioned Burn’s commitment to Wigan, given that he is due to leave for Brighton in January. Others have questioned his ability to succeed at Premier League level. However, by naming Burn captain yesterday Cook gave him a vote of confidence. Having missed much of the season due to an injury in a pre-season game at Rangers it is taking Burn some time to get back to his sharpest. With Chey Dunkley out for some time following a knee operation the manager will need Burn to forge an understanding with Cedric Kipre. Yesterday was only the second time they have started a game together as the central defensive pairing. The recorded interview with the Chief Executive of IEG, Yan Min Zhang, provided us with a glimpse of the group’s plans for the club. Zhang came over as bright, eloquent and thoughtful. He was also very diplomatic in his praise for Dave Whelan and what he has done for the club. Zhang carefully responded to questions about financial investments in the club, basically saying that money will be available but will it not be splashed about. Since then we have been informed that Darren Royle will be the new chairman. But we have not yet heard anything from him, which is somewhat surprising. In the meantime, the contractual situations of key players remain unresolved. Media coverage has largely focused on Nick Powell, although Sam Morsy has also been mentioned. Add to that should be the names of Alex Bruce, Nathan Byrne, Darron Gibson, Jamie Jones, Callum McManaman, Gavin Massey, Shaun MacDonald, Gary Roberts and James Vaughan. All have contracts that end next summer. The club and various mouthpieces for it have so often repeated that the morale of the squad remains high. But having around half of a senior squad out of contract at the end of the season must surely have influenced the climate within the club. Moreover, the players’ states of mind can hardly have been helped by the protracted nature of the takeover. We can only hope that the new chairman will make it a matter of priority to finalise extended contracts for the players that the manager wants to retain. Failure to do so would prove very costly in the long run. In the meantime, Paul Cook remains positive in his dealings with the fans and the media. These past months can hardly have been easy for him. He deserves credit for taking Latics to where they are in the Championship division at this stage, given what has been happening around him. Cook needs the financial support from the new leadership of the club to deal with the contractual issues and make meaningful moves in the January transfer window. Let’s hope it will be available.